Rain or shine, Randell Cottage will have its Open Day tomorrow Sunday 29 September. 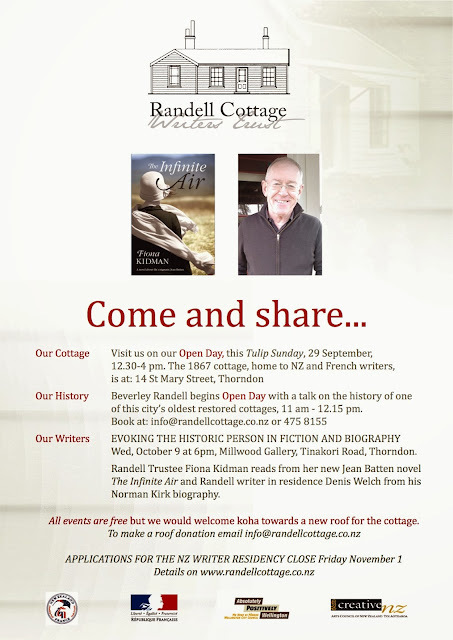 The writer residency for NZ and French writers opens its doors at 11 am with a history talk by writer and trustee Beverley Randell on the life of the 1867 cottage which she and her family renovated and gifted to the Trust. Her history talks last year were a hit and promise to be the same this year. Visitors can mill around the heritage cottage and garden from 12.30-4pm. 14 St Mary Street Thorndon. Free. Koha to re-roof the cottage.